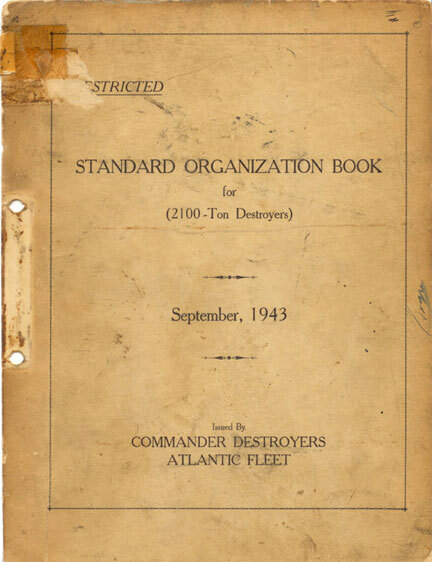 STANDARD ORGANIZATION BOOK for 2100-Ton Destroyers, October 1943 was created to help train the surge of new destroyer crew midway through World War II. From : Commander Destroyers, U S. Atlantic Fleet. To : All Commanding Officers and Prospective Commanding Officers of 2100-Ton Destroyers. Subject: Standard Organization for 2100 ton Destroyers. 1. Standard Organization for 2100 ton Destroyers is issued herewith, and is effective upon receipt. 2. This book is a revision of the Destroyers Atlantic Fleet Standard Organization Book for 1500 - 1630 Ton Destroyers issued March, 1943. Its use is mandatory for new construction destroyers upon commissioning. Operating destroyers will revise their bills to include the general principles laid down in this organization. 3. The subject Organization has been referred to Commander Destroyers, Pacific Fleet and is concurred in by him. Changes recommended by Commander Destroyers, Pacific Fleet have been incorporated. 1. Condition I or General Quarters. For Condition I every officer and man on the ship is assigned a battle station. The ship and damage control stations, engineering plant and the armament are fully manned. (a) Ship control stations fully manned. (b) All lookout stations fully manned. (c) All detection apparatus manned. (d) Water-tight Integrity Watch posted. (e) Engineering installation operating with split plant on one half boiler power. (f) One half the armament manned with sufficient personnel to permit opening fire immediately in case of sudden encounter with enemy submarines, surface or aircraft. (g) Sufficient men not assigned watches to permit preparation and serving of meals and caring for the sick. (h) Setting Condition I without any man being required to shift stations. To accomplish this it is necessary that certain officers and men be assigned alternate battle stations but the number must be kept to an absolute minimum to eliminate confusion. Assignments are for the ultimate armament of 2100 ton destroyers. Officers Stations. The functions listed in the accompanying table are those which normally should be carried out by an officer. Some of these functions can be combined and centered in one officer. The assignment of officers to battle stations or functions and combinations thereof as listed will be made with due considerations to the individual qualifications and aptitude. Whenever functions are combined the primary station number shall be entered opposite the secondary functions to show such combination. (NOTE: Each ship will eventually have a Disbursing Officer). Column two of the table shows type assignment for eleven line officers plus one medical officer. 4. In-Charge Fire Rooms-No. 2 Fire Room *Assistant Eng. Off. 14. Communication Control - Bridge Communication Off. * After Engine Room for Split Plant Operation. (a) The necessary functional operations to operate simultaneously at maximum efficiency the ship and all its appurtenances. (b) The stations required to be manned for war cruising. (1) No officer or man is required to stand more than a watch in three. (2) Sufficient men are relieved of all watches to permit preparation of meals and caring for the health of the crew. (3) Condition I can be assumed with a minimum of time and confusion and without any man having to shift stations. stations. It indicates the total number of functions required to be performed at these stations simultaneously. Column 2 (Name). Indicates name of man assigned station at General Quarters. To be filled in by individual ships. Column 3 (Rate). Indicates the type of rating required by the function listed in Column 1. Where no technical knowledge is required the necessity for a man is indicated by the entry of the numeral 1. Column 4 (Division) to be filled in by individual ships. Columns 5, 6 and 7 (Condition II or III (War Cruising)) indicates stations required to be manned for each watch in war cruising condition. Letter and numeral in these columns indicates general quarters station of man who normally should man station for each watch. The numeral 1 indicates that the station is required to be manned for war cruising condition but the specific assignment is left to individual ships. Space is available in each column for entry of men's names. J.O.O.D. Sound Officer Radar & Sound, or Chem. Recorder. 1. The Chief Gunner's Mate: General ordnance repair in charge of ammunition supply, magazine security, battery officer aft until required elsewhere. 2. Billets in the shell and powder supply at guns will be filled to the limit available and supplemented as practicable from other stations. 3. All hands will be instructed in first aid. 4. All stations assist as battle lookouts and gas sentries so far as primary duties permit and as directed specifically by control stations for the existing circumstances. 5. Repair parties will assist in reloading depth charge projectors and in supply of ammunition to automatic weapons as circumstances permit. 6. Lookouts shall be rotated with men on nearby stations as often as necessary to prevent loss of efficiency from eye strain and exposure. Continuous watches should not be stood by lookouts for periods greater than one (1) hour under any conditions. 7. Additional automatic weapons, if installed, should be manned by stations not normally engaged in anti-aircraft action (torpedomen, depth charge personnel, etc.). (a) Elimination or reduction of fire hazards. (b) Elimination or reduction of missile hazards. (c) Maintenance of watertight integrity. (d) Readiness to repair damage and to effect replacement of damaged parts. (a) Steps to be taken to eliminate or reduce fire hazards. (b) Steps to be taken to eliminate or reduce missile hazards. (c) Steps to be taken to assure the maintenance of watertight integrity and fighting efficiency. Note: 1. Fire control and topside instrument covers to be retained. 2. All canvas retained aboard shall be treated with flame resistant compound. 3. Fiber glass curtains and covers may be retained. 4. Kapok life jackets shall be treated with flame resistant compound. 3. Inflammable fluids and acids, (Cont'd.) gallon tins of hot running oil for torpedoes, five (5) five gallon tins of hydraulic oil (Univis 54), one (1) five gallon tin of symbol 2110 or 2135 oil, three (3) five gallon tins of boat lubricating oil, three (3) months supply of oil and grease used in operation and overhaul of machinery, inflammable medical liquids. 4. Inflammable foods, oils, matches and medical supplies. Stow in compartments below the waterline and issue in small quantities. 5. Paintwork. The key idea is the reduction of fire hazards resulting from paint. Comply explicitly with current instructions. 7. Impregnated bedding bags: Provide for all bedding including officers. Notes: 1. Retain one (1) brow used for catwalk. 2. Retain one (1) boat boom with ladders and rigging. (Not approved for DesPac.). 3. Retain two (2) stages and two (2) boatswains chairs. Notes: 1. Retain one (1) electric shore cable and reel. 2. Articles which are useful (continued) breakable doors and panels, glass in metal bulletin boards, surveyed material, titles B and C stores in excess of allowance, awning fittings, deck life jacket lockers, torpedo exercise heads, cameras (except official), airscoops and air port screens, excess reels for mooring lines and wire cables, electric shore cables and reels, surplus whips, blocks, tackles, fenders and pendants, bow numeral lights, joiner doors to officers rooms and in passages where watertight or gas-tight doors are provided, sounding machine and booms (for ships equipped with fathometer), wardroom and division commanders bookcases (except built-in types), buckets, metal ladder screens, garbage racks and chutes, oil burning running lights, kerosene lanterns and Wow torches (except for damage control), leadsman's chain, excess flasks of compressed gases. 2. Retain one (1) bucket for each ten men plus six (6) stowed in each repair locker. 3. Reduce supply of compressed gasses to absolute minimum and land all surplus and empty flasks. 3. Semi-fixed equipment, including wrenches for doors, ports, hatches and deck pads, spanners, battle lanterns, electric heaters, chain falls. Stow or lash in place. 1. Deadlights on fireroom hatches. Replace with metal. 2. Shores, wedges, leak stoppers and plugs. Provide in each living compartment and engineering space below the main deck. 3. Flashlights. Issue to personnel and stow spares in clips throughout the ship. 4. Chemicals for decontamination. Provide and stow. 5. Gas masks Stow in sealed containers. Issue when directed by task group commander or senior destroyer officer present. 6. Protective clothing. Impregnate and issue or stow in vicinity of battle stations. 7. Dry and canned provisions Maintain small supply in area distant from regular storerooms. I-C-1. The object of the gas defense bill is to organize the ship's company to provide an adequate defense and protection against chemical warfare attacks. Such an organization requires the early detection of presence of poison gas; the dissemination of this knowledge to all hands; the complete and rapid functioning of protective devices without disrupting the fighting efficiency of the ship; the determination of the kind of gas used in the attack; cleaning the ship; and treatment of casualties. I-C-2. An officer shall be designated as Gas Defense Officer and will be responsible for the training of the crew, holding of drills, care of equipment, and details of the gas defense organization. He shall, by carefully studying the subject, be fully acquainted with the equipment and methods used. It is important that lie he able to distinguish between contaminations. In ease a graduate of the Chemical Warfare School is on hoard, he shall be detailed as Gas Defense Officer. I-C-3. The signal of gas attack shall be the sounding of the chemical alarm and the word being passed over the announcer system. I-C-4. On destroyers, defense against gas attacks is based on the utilization of the individual protection method (gas masks and gas protective clothing), and the taking of the necessary preventative measures to obviate contamination. (1) Prevention of the adherence of the chemical to the ship's structure. (2) Prevention or restriction of gas diffusion throughout the ship by maintaining strictly Condition Afirm. (3) Prevention of the delivery of the gas attack by shooting down planes, or maneuvering. I-C-5. The clean-up squad is organized from the repair party and should consist of at least four men. All men in the repair party must receive special instruction in gas defense and clean-up material and methods. When circumstances indicate the advisability of same or when directed by competent authority, gas masks will be issued to every member of the ship's company. All men will be trained in the proper use of gas masks at frequent intervals. The Gas Defense Officer should endeavor to make the training and instruction of the gas sentries, clean-up squads, and remainder of the crew progressive. Protective clothing will be issued in accordance with directives contained in Strip Ship Bill.